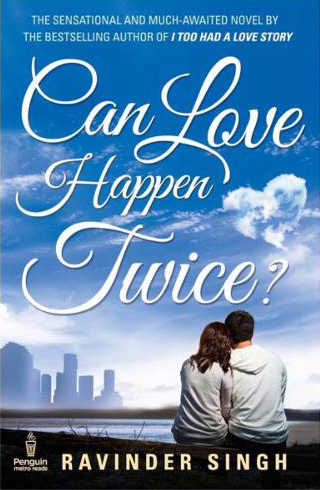 The Virtual Life: Can Love Happen Twice? 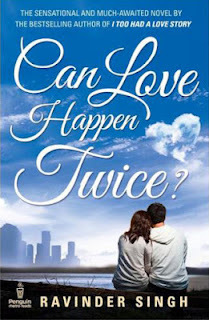 Recently, I read the most awaited novel Can Love Happen Twice? of Ravinder Singh the author of I too had a love story.. It is an easy read and you can complete it in 4-5 hours at max if your reading speed is good and if you find at least something interesting in it or you got some curiosity to know about Ravin’s (author) life. But I believe you will not get to know much about the real truth because it seems it is half imaginative and half real. As the author himself had written in the preliminary pages that “maybe this is my story, maybe not, maybe it is only partly my story, maybe not, maybe it is an amalgamation of several stories that my readers write to me , maybe not.” There are so many maybes but I think it is only partly his story. As what happened with Ravin in the end of the book cannot be true logically because at present he is doing MBA and you will also feel after reading that it is just fictitious. So the novel is only maybe partly his story. Now let’s get back to the book. It is about a guy Ravin (who is might be the author himself) who got a onsite project in Belgium and after spending 2-3 weeks alone there except working finds a girl named Simar who is doing here MBA there. Then they started talking and meeting more often and next thing is very obvious they fell in love and love happened second time. The rest of the part of their story is history which happens in every love story that they started romancing, making love, sharing their time & things, having dinners, coffees and so on. And after 10 months or so the guy has to get back to India and they got parted with physical distance as well as with distances in their hearts. Ravin wants to marry her but Simar wants to live her life with all the liberties and therefore, she keep on giving various excuses and ignoring him. Why she did not want to marry him have some other serious reasons and to know that you should read the book. Ravinder Singh’s last and debut novel I too had a love story.. was really awesome it made a lasting impact on my mind and heart too, most of you will agree with me if you had read that one but this one is not so good. Like the last one this one also had a sad ending but it did not touch my heart much, may be because I don’t like love stories much now. I read this only because I wanted to know what happened with Ravin after Khushi’s demise. And to the answer of the book’s title I would say yes, love can happen twice if only you let it happen but still first love is first love. awesome first novel equally dissappointing second one.. the first one was best.. i mean the idea of falling love on matrimonial site was new.. any ways.. you are a good blogger.. how about link exchange?